V.G Somasekhar, Airtel Uganda’s Managing Director. 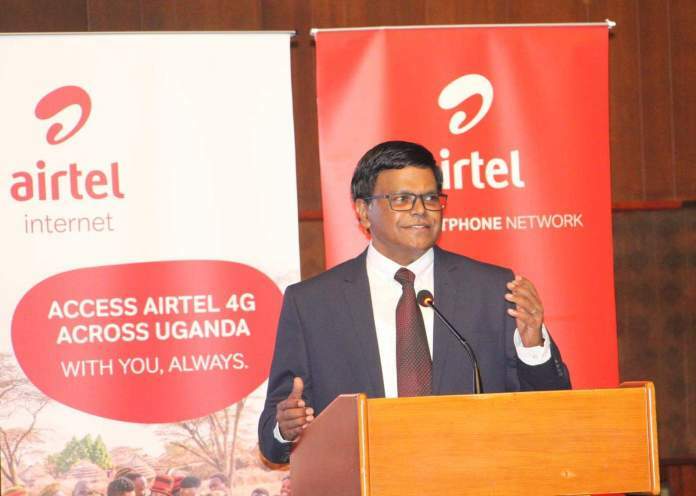 KAMPALA – Airtel Uganda, the country’s second-largest telecom network has announced the availability of nationwide 4G connectivity following the complete modernisation of its network. The technology is expected to significantly enhance the network experience for Airtel’s smartphone customers. “ 4G technology is reliable and will improve our communication; we can expect better service delivery, improvements in public accountability through e-Government, improved education, tourism, and innovative goods and services,” he said. Airtel now has 1,632 sites and over 3,900 kilometers of fibre across Uganda, covering 95.9 percent of the population, making it possible for subscribers all over the country to get better internet services. In Uganda, Airtel uses a spectrum bank which includes 2300 Mhz (TD LTE), 1800 Mhz (FD LTE), and 900 Mhz (LTE 900) to offer 4G services to customers. The company has also deployed advanced network technologies and tools such as pre-5G massive MIMO and 4G advanced carrier aggregation to step up its high-speed network capacity and coverage. The company last year signed an agreement with Social networking giants Facebook to improve the communication company’s infrastructure in the country. Mr Kojo Boakye, Facebook’s African Public Policy manager, Yonas Maru – Managing Director of Bandwidth and Cloud Services Group (BCS), a wholesale bandwidth provider focused on deploying infrastructure in East Africa. According to Facebook, a total of nearly 800 KM of the optical fibre were to be laid in Northern Uganda including Gulu, Adjumani, and Arua. The project aimed at proving backhaul connectivity covering more than 3 million people in Uganda and enable future cross-border connectivity to neighbouring countries. He also argued licensed operators to continue modernising ICT in Uganda and to drive digital inclusion through accessible, affordable and fast internet for all.